I’ve decided Goals are not Stupid. In fact, I’m making a list of them right now. But I have pretty much stopped writing this blog. I do, however, post occasionally about freelance writing and editing and related subjects such as publishing and grammar on my other website, christinerowlands.com. Thanks for stopping by, and feel free to look around! Scrounge up an inner tube, air mattress, inflatable boat, or anything else that floats. Blow it up if it’s flat, and patch it up if it leaks. Get beer; rig up a bag and rope so that you can float it behind the raft and keep it cold. Decide on a spot to put in, and ask someone (preferably with a truck) to pick you up in a while, at your destination. Go where the river takes you. There’s nothing like a good float down the river on a sunny summer afternoon. Especially if the weather holds out (it always seems to get cloudy, mid-float), and the river is deep enough to swim in, yet not so shallow that your floatie gets snagged and dragged on the rocks. A few rapids are nice; nothing that would remotely capsize you, just for a little excitement in an otherwise lazy progress. Although a confirmed city kid, I was lucky enough to spend most of my childhood summers at my granny and grampa’s house in the country. Their house is right on the Kettle River, truly one of the best rivers around for summertime floating. Around midsummer, it is low enough and warm enough for swimming and there are plenty of accessible spots on the river banks to either go for a dip or put the rafts in. You can choose a long float, say from the Kettle River Recreation Area to the sandy beach locally known as “the Deep Hole.” Or perhaps a shorter ride, from the little beach just behind the Prospector Pub to… wherever you feel like. Some people take a float all the way down to Midway, where the Kettle crosses down into Washington State. These days, of course, I can’t take a whole summer off. So when I do go up there, I make sure that if the weather is good, we’ll spend an afternoon on the river. Even better if one or more of my cousins is in town and we can spend the time catching up and talking about old times while drinking some fine domestic beers (the Rock Creek store doesn’t cater to your city-folk microbrew fetishes) and cooling off by occasionally jumping in and swimming alongside the raft. 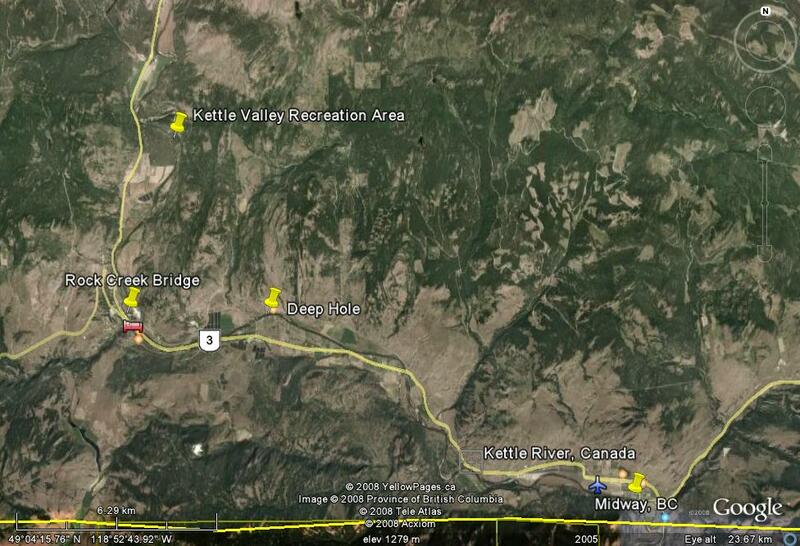 With very little industrialization, development or even damming upriver in the Kettle Valley/Christian Valley areas, the Kettle River remains very clean, at least for the moment. With more people moving into the Okanagan Valley, just over the mountains, however, I’m not sure how long it will stay its lovely self. All I know is that in the Kettle River, floating or swimming in the current, I feel perfectly happy in a way that I do in no other place. 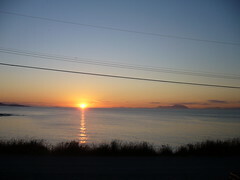 Two things contributed to my plan of action: the climate change whatever cheque from the government, and a friend’s photos on Facebook of her own solo getaway. The $100 allowed me to buy a rack and a pair of good-sized panniers for my bike, and the photos got me thinking of a way to put them to use. I spent some time noodling around on the Provincial Parks website, looking for a place that would be easy to get to on a bike, yet remote enough that I could enjoy it in relative solitude. As in, few chances of running into carfuls of rowdy stabbers and their hoochies breaching the peace on the beach. I found my destination at Car-Free BC, a website/book that provides all the info you could possibly need about destinations and activities in Southwestern BC that can be reached by self-propelled or public transportation. 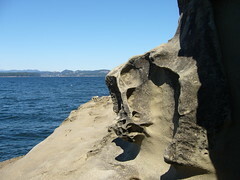 Listed under both bicycle touring and weekend getaways, Gabriola Island sounded perfect. I had been scuba diving there years ago, although had never set foot on the island itself. It would be a new place, yet small enough to be manageable for my first cycle tour. 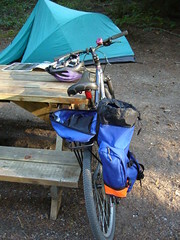 Plus, the campground is less than a kilometre away from the ferry terminal, so I wouldn’t have to go far with my load. 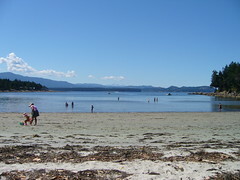 To get there, you need to take two ferries – one from Horseshoe Bay to Nanaimo, and a second from Nanaimo to Gabriola. Bike transportation currently adds a mere $2 on the Nanaimo-Horseshoe Bay run, and costs nothing extra for Gabriola. Plus, ferry fares are return to Gabriola, meaning that if you spend all your cash, you’re not stranded there – though I could think of worse fates. 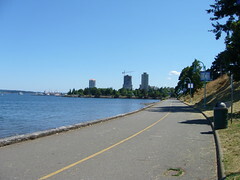 The two ferry terminals in Nanaimo are separated by a nice little seaside path. However, the path is clogged by the most dazed, meandering senior citizens and tourists I’ve ever seen. Sideswiping one of these wanderers with my hobo-style load was tempting. My sister lent me a small tent, and advised me to make my stuff look a little “junky” to make it less of a target. So I strapped on a garbage bag over the load with bungee cords. It flapped in the wind nicely. But perhaps I need not have worried. There’s an unwritten code about travellers messing with one another’s bikes, and campsites too. 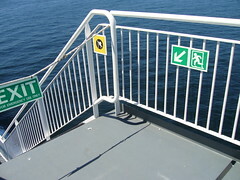 On the ferries and on Gabriola, with nary a bike rack in sight (maybe one at the grocery store), I pretty much always left the bike, bags, and accessories unlocked, without incident. Once I arrived, the really nice thing I found about solo camping was the ability to go at my own pace. I had a borrowed tent with no instructions on how to put it up, but I just went about it, figuring it out from past experience. The campsite was at the wonderful Descanso Bay Regional Park, which has a lovely bay for swimming (at high tide, in the afternoon) and beachcombing (at low tide, in the morning). 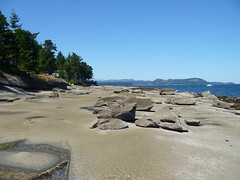 Gabriola was under a fire ban, meaning no campfires. I gambled on being able to roast weiners, and so did not bring my portable camp stove and propane. No matter – I could live on wine and cheese, and a couple of bakeries/cafes were not too far along the road for my morning caffeine needs. From my campsite, the cafe near Twin Beaches was the best, the other place being at the top of a wicked hill. The first day, I had a lovely lazy beach day. 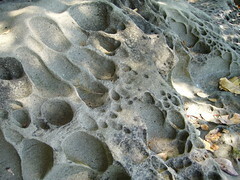 The sun was out, there wasn’t a cloud in the sky, and you can walk along the shore for miles over amazing sandstone formations and check out all the little tidepools. 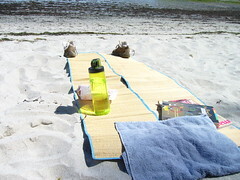 I checked out the Malaspina Galleries and then walked up to Gabriola Sands Park (locally known as Twin Beaches), where I spread out my stuff, and just laid in the sun, reading and eating. Perfect. 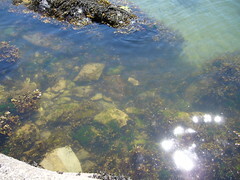 The only drawback was that the tide was way out, so to go swimming, I would have to walk over plenty of mud and shells and rocks. I did eventually switch beaches when some idiot’s cell phone kept making the low battery sound (hey! you! turn it off!) and found the tide was in much further on the other side. But it was super-shallow, not much good for swimming. I waded carefully to not to step on the little scurrying crabs (my astrological sign, y’know). However, when I got back to the campground, conditions were just right for a swim. Later that evening, I was sitting around at my picnic table, drinking wine, reading, and wondering what to do with myself until sundown. A girl happened by, another solo female camper as it turned out, and asked if I wanted to go hitchhike with her to the Surf Pub, have some drinks, and watch the sunset. A tremor of anxiety shot through me, but I said sure. We walked out to the road, stuck our thumbs out, and before long had a ride with a couple of Islanders, older guys we’d seen at the beach earlier. Turns out she’d had almost my exact same itinerary that day. Huh. Her plans were much more ambitious than mine, as far as camping went. While I was just off on my own for a few days to get away from the pressures of home and just reflect, she was planning to be nomadic for summer, camping and going to festivals, before taking a TESL course and then travelling for a few years. 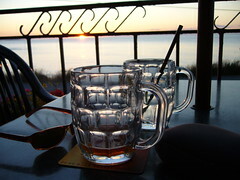 As we sat and talked and nursed our drinks on the Surf Pub patio, I sincerely hoped that I wasn’t boring this girl to regret, or getting on her nerves with my barely concealable anxiety about drinking too much, getting a hangover, or not getting a ride back. The sun went down, the locals continued to gather, the band started up, and a weird guy who reminded me of my uncle asked to sit at our table. My new friend ordered us some margaritas. Oh, she was bad. But she seemed to tolerate me, so I tried to loosen up. That’s one thing about travel… you have to relinquish a little control and squelch your fears. At the very least, I felt I could trust her “go where the wind blows” attitude and openness to find us a ride home (and she did). 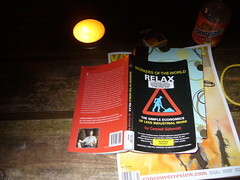 She had a wonderful energy – at one point she was talking to an older guy who was visiting from Calgary, and asking why wouldn’t he give up the rat race there to come to Gabriola full time and do what he enjoys? And just for a second, you could see him really thinking about that, imagining it. She included us both as members of the solo female camper club, even though our ways and outlooks seem radically different. But thanks to her inspiration, I made this short trip more just a lazy beach holiday and really challenged myself. 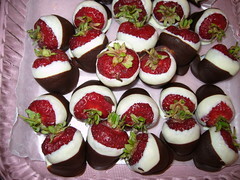 The other day I was doing my little agricultural thing, going to the u-pick to gather delicious fresh BC strawberries. It was a weekday, so my willing slave and I were the only adults there of working/childbearing age who didn’t have a bunch of little kiddies with us. A couple of rows over, a child starts wailing and screaming. She’s tired of this picking business. Waah, waah, waah, and making noises that you didn’t know a human could make. “Has seen on the Internet a good site. Personally to me has liked. Thank you kind spammer. You have been noted, and deleted. Uh, yeah, and all that. I’m really such a nice person. I have a dog, I throw parties, I cook for people who never ever take me to dinner. My theory, and it’s not such an original one, is that all good people have an evil twin. Kind of like in cartoons, the angel and the devil sitting on the shoulders. And you, goody-goody, are your very own evil twin. The good twin gives up a seat for old ladies on the bus, even in the non-courtesy seats. The evil twin walks through crowded parking lots in shopping malls at Christmas holding out her keys. When she suckers a minivan into following her (evil twins hate urban trucks) she ducks between a couple of cars and waits said gas-guzzler to flip on the signal. And oops! That wasn’t my car! I don’t even have a car!